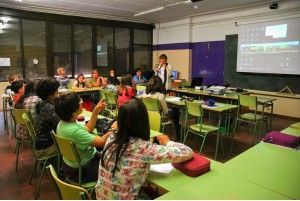 ACVic Centre d’arts Contemporànies collaborated on the Fotografia en curs, a proposal from the collective A bao a qu, bringing together the Andersen school [http://www.escolaandersen.com] in Vic and artist Tanit Plana. The Andersen project consisted of a workshop with the students of the school. A Bao A Qu [http://www.abaoaqu.cat] is a nonprofit cultural association dedicated to conceiving and developing projects which bring together education and artistic creation. Founded in 2004, since its beginning it has introduced creation in schools and colleges by professionals in the field of art and culture. Fotografia en curs is an ongoing programme of education and the dissemination of photographic creation which began in 2012. The project saw four major areas of development: Workshops in schools through training teachers, with the occasional participation of photographers; activities and workshops in museums, arts centres, archives and cultural facilities; training for teachers; and Web. This project was related with Art i Escola 02 [http://artiescola.cat], a project in which the Andersen school participated. The participants, 103 pupils of the 5th and 6th year primary school school, devised a project for Art i Escola, a discussion about TIME in relation to the school's history, based upon photographic work. Looking at old photographs, some of these transformations may be seen, and changes recognised. 5th and 6th year pupils worked in small heterogeneous groups to facilitate teamwork and independence during activities. To serve as a guideline, a working folder was developed in order to contextualise and give a presentation to the project. After viewing twenty old photographs of the school, several of the sites represented in them were chosen, and the original photograph reproduced as it is in the present day. From a comparison between the two images, current changes were observed with the transformation of spaces, customs, people, events and the surroundings trhough time. 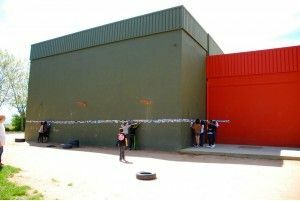 A work of literary and artistic creation was undertaken, as pupils imagined what the spaces within the photographs would look like in the future. Pupils wrote about the school and chose a technique to capture an image of the future in A3 format. 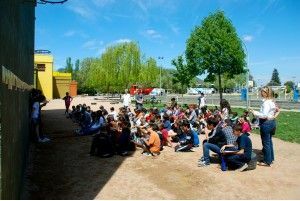 Pupils also researched the history of the school, including the testimony of two former teachers, founders of the school, Xita Vernis and Mercè Paracolls, and consulted the school's Educational Project, where they found and collected relevant dates in chronological order, each pupil transferring the information to a timeline. With the collaboration of the Associació A Bao A Qu and the participation in its "Fotografia en curs" programme, a group of 18 students took a photographic journey, tracing the history of the school, from its initial location, through other schools which merged with it: St. Albert and Balmes, until its present-day location. During the journey, photographer Tanit Plana took a photographic workshop, focused upon capturing images of objects, people and places, as well as making a record of work. The resulting photographic itinerary included a chronology of the activity, and the historical time of the documentation of the school sites. 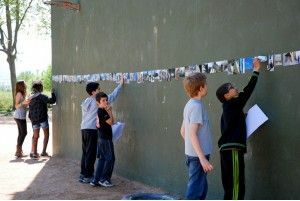 The final selection of photographs taken by students were displayed as an image timeline. There was a joint exhibition of all work in the school, in order to share with the educational community at large reflections on time as a transformational element. We also participated in the exchange session promoted by Art i Escola 02, and in the subsequent presentation of results of the work of all participating schools.